Failure Analysis Lab - SEM Lab Inc.
SEM Lab, Inc. is a failure analysis lab providing services to many branches of manufacturing, such as the electronics, medical or aerospace industries, where it is a vital tool used to determine the cause of a failure in order to keep it from recurring. SEM Lab, Inc. has failure analysis expertise covering metals, ceramics, polymers, composites, and many more. Our failure analysis lab has performed thousands of root cause analyses and has experience with a wide range of failure modes, materials and processes. We would be happy to discuss your issue to determine a plan of action. Some examples of our failure analysis work can be found here, divided into 4 sections, device examples, materials examples, cross-section examples, and miscellaneous examples. We also provide documentation on specific failure analysis issues we have encountered over the years here. These include Intermetallics in Solder Joints, Failure Analysis of LEDs , Failure Analysis of BGAs, Gold Embrittlement of Solder Joints, Failure Analysis of PCBAs, Diffusion Barrier Plating in Electronics, Images of Failures in Microelectronic Packaging, Fourier Transform Infrared Analysis, and Failure Analysis of Aluminum Electrolytic Capacitors. Please contact us to discuss your specific issue. Current and on-going examples of our work can be found on our blog. 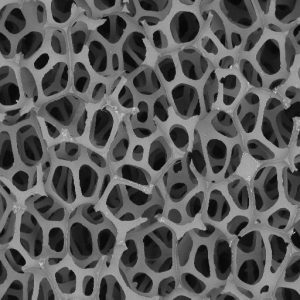 SEM image of a ceramic sample.